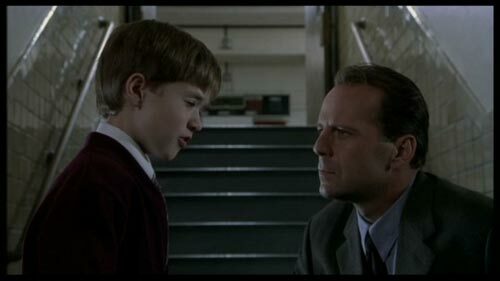 And this week’s (July 26-August 2) winner is… The Sixth Sense! Be prepared to get spooked in the next little while everyone, because all week we are going to be–now whisper this–seeing dead people! When the votes came in there was a tie between this movie and Lion King. Poor Fight Club got the least amount of votes, but that flick gets the last laugh–it’s number 10 in IMDb’s list of top 250 movies of all time. Not to mention the fact that it has two of today’s very best actors in it, both giving raising-the-bar performances. Like my brother, Norton is one of my all-time favourites. Anyway, we should move on since we’re really not supposed to talk about Fight Club. There is such a cool combination of surprises in this movie. Now don’t worry, there are no spoilers in this posting. I hate spoilers. That and people who talk through movies. Moving on… First there is M. Night Shyamalan. At this point he was a new name to most of us movie-goers. Here was a film that just snuck into the theatres and almost immediately had people talking. For a long time it was both cool and funny to lean in towards someone and say, “I see dead people!” or perhaps create a parody where you’re standing in a bakery and whispering, “I see bread people.” And though it’s not quite as popular of a punchline, it’s still quoted throughout popular culture. M. Night was now the favourite director of millions. Then there was the cast. As more than one person pointed out, this was not a typical role for Bruce Willis. Haley Joel Osment (the kid) both weirded everyone out and won everyone’s hearts with his deep, innocent child eyes. Then there’s all the dead people. Seriously–many actors/actresses who are still virtually unknown were a part of scenes people still refer to today and will continue to for a very long time. For me it was the mom, but I will stop there… no spoilers. Then there was the twist. I will not identify it, but it’s unforgettable. M. Night seemed to capture the spirit of Hitchcock with this movie. And most of us who love this movie love it first for this it’s jaw dropping ending. Huge Oscar nods, of course, to Fight Club and Lion King. I think I have every song on LK memorized, and if there is a movie that is deeper, more challenging, or more thought-provoking than Fight Club, I don’t know what it is. Very deserving of it’s #10 on IMDb’s list. And the Oscar goes to: Actress: Helena Bonham Carter. She is always great in movies so she deserves to be this week’s actress. Plus the fact that all three movies are male-dominated, so the pickings were slim. No offense Helena. Actor: Tie: Brad Pitt and Ed Norton. This can’t even be argued, unless you count Mr. Bean’s performance as the Froot Loops bird in LK. So that concludes another great week of movies. If anyone is wondering what to get me for Christmas this year, I’d love a pink bar of soap with “Fight Club” embossed on one side. 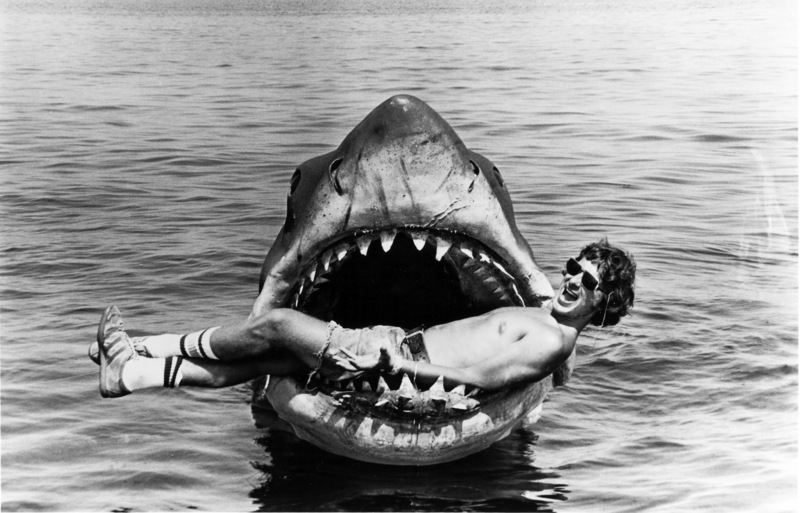 This week’s (July 19-26) movie of the week is… JAWS! And this week’s winner is……. Jaws! How fitting that the 1975 summer blockbuster (Which from what I hear paved the way for all future “summer blockbusters. Some even call it the first one ever.) about a giant rogue Great White that terrorizes Amity Island’s inhabitants, starting off with–of course!–a beautiful young woman who happens to be skinny dipping. Similarly, if I asked you if you knew the song “Flight of the Valkyries,” most of you (Including myself actually… had to look it up.) would likely say no. If I played it through a speaker, most of us would recognize it, but not likely associate it with a movie, even though it’s a pretty cool scene in Apocalypse Now. Many would recognize The Godfather’s theme with its Italian (or Sicilian?) sound of a foreboding horn and a briskly strummed mandolin that transports you straight to a quaint European cafe eating spaghetti with a soft spoken elderly gentleman wearing over-sized, thick, square glasses on a bulbous nose and sporting both a receding hairline and a not-so-receding forest of grey chest hair leaping out of a low buttoned, goldenrod dress shirt. But not everyone. Yet who does not know the theme song to Jaws? For that matter, who doesn’t feel goosebumps chasing each other up and down their spine when hearing those first two ominous chords? If you asked anyone–anyone at all–if they’d ever gone swimming and thought about sharks because of this movie, we can only guess how high that percentage number would be. The same can’t be said of a similar poll asking people if they ever went to bed worrying if a horse’s head might be tucked under the sheets or if they ever wondered how nice napalm might smell in the morning. Many things make a movie great, though I believe the number one ingredient in such greatness is that they make you feel something. There is no question that Jaws made us feel something. Fear. Disgust. To an extant, empathy. And the warm trickle of urine down one’s leg, especially when Richard Dreyfus decides to go down in the water in the cage. Is he nuts?! Congratulations Jaws. This is your week. And the winning quote of the week: “Leave the gun take the cannolis” (Thank you David Presley, and to your cat Quint, too.). And the Oscar goes to: Actress: Talia Shire. She was actually the only actress to get a nomination, but the fact that she shone in both The Godfather and freaking Rocky (seriously, how awesome is that movie??) makes her this week’s best actress. Actor: Al Pacino. No he doesn’t scratch his chin in an awkward way, stroke a cat, or even suggest giving a non-refusable offer, but the dude knocked his role out of the park. Never ask me about my business!! I should mention, though, that a huge Oscar nod needs to be given to Brando. He’s the only one who appeared in two of this week’s movies. Alright kids, careful at the beaches this summer. Watch out not just for sharks, but for flying shrapnel and floating bodies. …Man, I am so in the mood to watch a movie right now. If you don’t know the drill, check out the post below. 1. The blog. Go to thisweeksmovie.wordpress.com (or just click thisweeksmovie.wordpress.com). You will find the weekly movies listed there. Each Saturday a new list will appear. 2. Your choice. Choose the movie that you believe deserves to be MOTW and leave a comment on the particular blog posting. In your comment box, put your pick as #1 and then put the other two in order of which ones you think are 2nd and 3rd best (in your humble opinion). 3. Your nominees. In the same comment box, nominate any two actors, one male and one femail, from those movies to be actor/actress of the week. 4. Your quote. Feel free to give a favourite quote from the movies listed. A quote of the week will also be announced. 5. The results are in! Every Friday I will publish a new post declaring who I believe are the winners, (based on votes and… well, other factors… I mean I have to reserve some editorial license. I couldn’t possibly let, say, Robert Pattinson beat out Kevin Spacey or anything crazy like that, right?) plus a little commentary on those movies and why they’re on IMDB’s list in the first place.